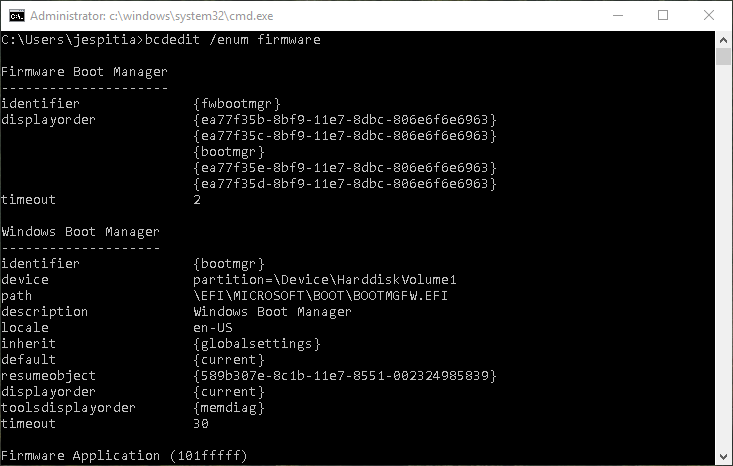 We recently purchased quite a few Dell XPS 13 9365 laptops and while testing our image; I noticed that the list of Windows Boot Manager entries in the BIOS was growing each time I would image the laptop. In order to get around this, I had to create the following script that would automatically scan through the Boot Configuration Data (BCD) store and remove all of the duplicate GUID’s that appear after running the image. Write-Host "PREPARING TO REMOVE DUPLICATE WINDOWS BOOT MANAGER ENTRIES"
Write-Host "SKIPPING - COULD NOT LOCATE DUPLICATE WINDOWS BOOT MANAGER ENTRIES"
Once you are ready to use the script, go ahead and copy it over to your Deployment Share and add it to your State Restore group in your MDT Task Sequence. Since this was not happening to all of our computer models, I made sure to add a Task Sequence condition that forced this step to only run for the Dell XPS 13 9365 laptops. Feel free to leave any questions below! The following script is intended to run after an in place upgrade (Ex: 1607 to 1703). If you do not know how to run a post script after an upgrade, please refer to my previous post here. The Powershell script will copy your old wallpapers from C:\Windows.old\windows\Web\Wallpaper\Windows\ and C:\Windows.old\windows\Web\4K\Wallpaper\Windows\ to their appropriate folders. It will also uninstall OneDrive, and prevent OneDriveSetup.exe and Windows Defender from running at logon. As well as remove the Contact Support application, move Office 2016 applications to their appropriate folder in the Start Menu (During my testing, these shortcuts moved around randomly), and attempt to remove any new apps that have reappeared with the upgrade. Write-Log -Passed "Copied C:\windows\web\Wallpaper\Windows\img0.jpg to C:\windows\web\Wallpaper\Windows\img0.jpg" -Failed "Failed to copy C:\windows\web\Wallpaper\Windows\img0.jpg to C:\windows\web\Wallpaper\Windows\img0.jpg"
Write-Log -Passed "Copied C:\Windows.old\windows\Web\4K\Wallpaper\Windows\$FileName to $FilePath" -Failed "Failed to copy C:\Windows.old\windows\Web\4K\Wallpaper\Windows\$FileName to $FilePath"
Write-Log -Passed "Uninstalled OneDrive successfully" -Failed "Failed to uninstall OneDrive"
Write-Log -Passed "Renamed C:\Windows\SysWOW64\OneDriveSetup.exe to C:\Windows\SysWOW64\OneDriveSetup.exe.old" -Failed "Failed to rename C:\Windows\SysWOW64\OneDriveSetup.exe to C:\Windows\SysWOW64\OneDriveSetup.exe.old"
cmd /c REG LOAD "HKLM\DEFAULT_USER" "C:\Users\Default\NTUSER.DAT"
Write-Log -Passed "Removed OneDriveSetup from the default profile's run key" -Failed "Failed to remove OneDriveSetup from the default profile's run key"
cmd /c REG UNLOAD "HKLM\DEFAULT_USER"
Write-Log -Passed "Removed SecurityHealth from the current user's run key" -Failed "Failed to remove SecurityHealth from the current user's run key"
Write-Log -Passed "Removed the Contact Support application" -Failed "Failed to remove the Contact Support application"
$OfficePrograms = GCI "C:\ProgramData\Microsoft\Windows\Start Menu\Programs" | Where-Object name -like "*2016.lnk"
Write-Log -Passed "Copied $OfficeFilePath to C:\ProgramData\Microsoft\Windows\Start Menu\Programs\Microsoft Office 2016\$OfficeFileName" -Failed "Failed to copy $OfficeFilePath to C:\ProgramData\Microsoft\Windows\Start Menu\Programs\Microsoft Office 2016\$OfficeFileName"
$AppsList = "Microsoft.WindowsFeedbackHub", "Microsoft.XboxIdentityProvider", "Microsoft.Windows.HolographicFirstRun", "Windows.ContactSupport", "Microsoft.XboxGameCallableUI", "HoloShell", "HoloItemPlayerApp", "HoloCamera", "Microsoft.OneConnect", "Microsoft.People", "Microsoft.XboxSpeechToTextOverlay", "Microsoft.XboxGameOverlay", "Microsoft.SkypeApp", "Microsoft.MicrosoftSolitaireCollection", "Microsoft.MicrosoftOfficeHub", "Microsoft.3DBuilder", "Microsoft.Getstarted", "Microsoft.Microsoft3DViewer", "Microsoft.Office.OneNote", "Microsoft.XboxApp", "Microsoft.ZuneMusic", "Microsoft.ZuneVideo", "Microsoft.MSPaint"
Write-Log -Passed "Removed $App" -Failed "Failed to remove $App"
Write-Log -Passed "Removed $ProPackageFullName" -Failed "Failed to remove $ProPackageFullName"
If you are planning on upgrading your Windows 10 OS from 1607 to 1703 you may have noticed that a few apps have reappeared. Luckily for us, Microsoft has provided a way to add parameters to upgrades with the SetupConfig.ini file. Note that the header [SetupConfig] is required. How does the upgrade use the SetupConfig.ini file? How do you run a post script? How do you run a Powershell script? The only way that I have been able to run a Powershell script is by running it from the .cmd file that I have called using the PostOOBE parameter. I hope this post helps you understand the power of this ini file. Feel free to leave any questions in the comments and stay tuned for the cleanup script that I am currently working on! UPDATE: The post clean up script can be found here! The Contact Support app can now officially be removed but the process is a little different than how you would normally remove a Windows app with Powershell. Luckily it isn’t too difficult and it can be done with a one liner! I recently ran into an issue where MDT could not determine if our new Dell XPS 13 9365 was a laptop or desktop. After running wmic path win32_systemenclosure get chassistypes, I was able to determine that the chassis type 31 was not listed in MDT’s ZTIGather.wsf. Adding 31 to ZTIGather.wsf (Line 417) as shown below, fixed the issue and MDT was now able to determine that the XPS 13 9365 was a laptop! Case "8", "9", "10", "11", "12", "14", "18", "21", "31"
Case "3", "4", "5", "6", "7", "15", "16"
Feel free to leave any questions in the comment section! During our Windows 10 testing, we noticed that some users would randomly come across the universal unique identifier (UUID) type is not supported error when they logged onto their computer for the first time. In order to get around this error, Microsoft provided a work around that would work with SCCM. Click here for the article. Unfortunately this does not work well with MDT because the administrator account does not have permission to add a value to the “HKLM\SYSTEM\CurrentControlSet\Services\gpsvc” registry key. The following Powershell script will fix this by changing the owner of the key to the Administrators group and also providing full access to the Administrators group. This will be temporary since sysprep seems to revert the permissions after it has processed. Fortunately the value stays with the registry key! 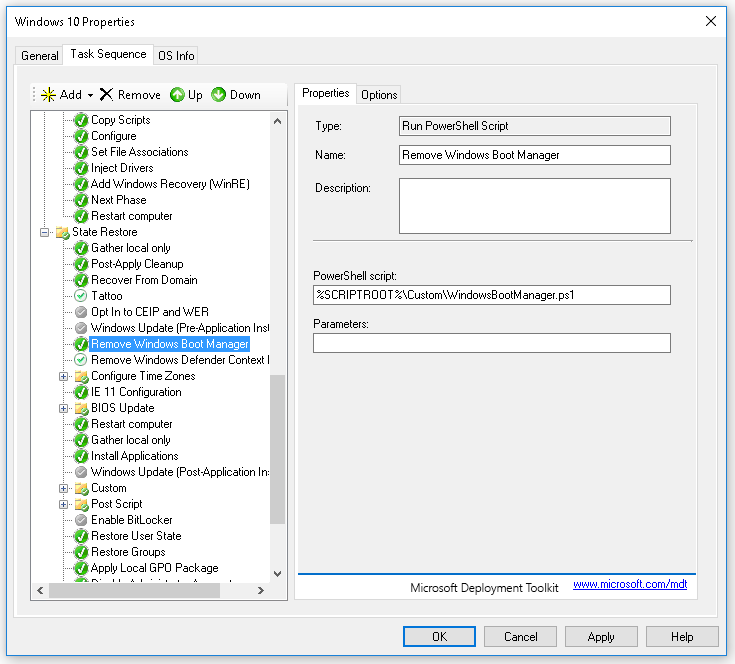 Note: In order to have this fix work successfully with MDT, we will need to configure the script to run before the sysprep step in your capture task sequence. Feel free to leave any questions in the comments! First you will need to export the configuration for the wireless profile that you would like to add to your task sequence. Note: You will need to connect to the wireless profile before you can export it. The export should have copied an XML file to your desktop. In order to keep this simple, go ahead and rename the XML file WirelessProfile.xml. Now, copy WirelessProfile.xml and place it inside of your Deployment Share. For this example, I will be copying the XML file into a folder called Custom, inside of your scripts folder. Now go ahead and open up your task sequence and add a “Run Command Line” task inside of the State Restore group. 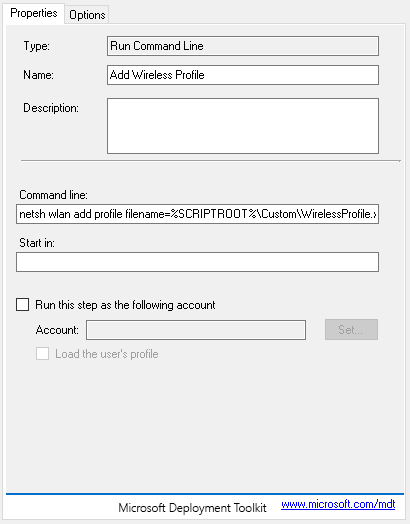 You can name the task anything you would like but in this example I have named it “Add Wireless Profile”. There seems to be an issue with running XML files that are not stored locally. If the command to add the wireless does not work, try copying the XML file locally and then running the command. Now you will have a pre-configured Wireless profile! 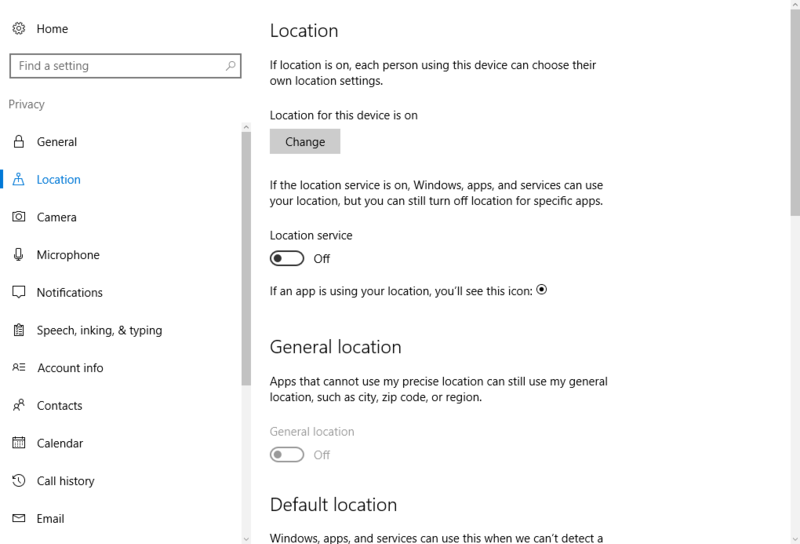 The following registry keys in this post control the privacy settings in Windows 10 1607. These settings can be found in the GUI by going to SETTINGS\PRIVACY. Pin shortcuts to a user in a specific Active Directory group. 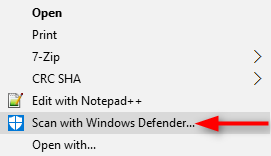 $Group = "YOUR AD GROUP HERE"
The following short batch script will automatically remove “Scan with Windows Defender” from the context menu for files, folders and drives in Windows 10.